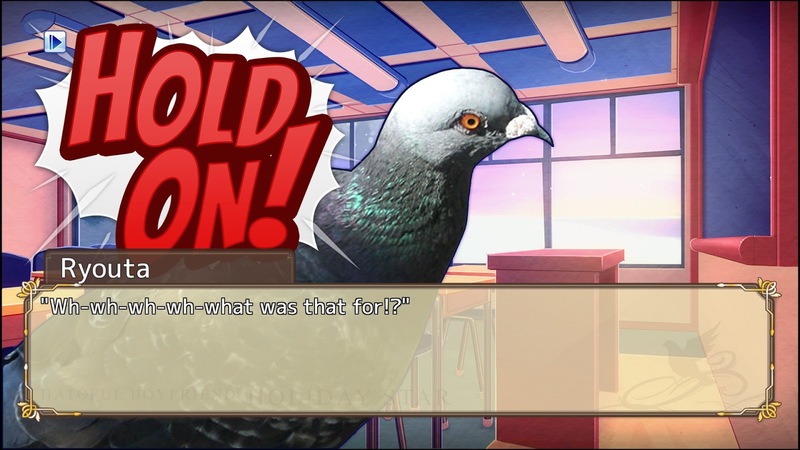 Hatoful Boyfriend: Holiday Star Review – Groooo grooo! Leave a Comment on Hatoful Boyfriend: Holiday Star Review – Groooo grooo! Have you ever read Roger Ebert’s Pokemon: The First Movie review? 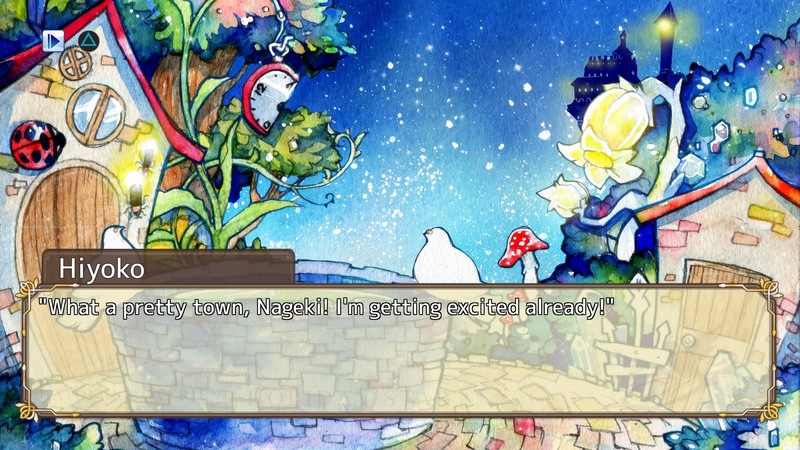 He succinctly states that “there are times here on the movie beat when I feel like I’m plain in over my head.” I’d like to echo that in regards to Hatoful Boyfriend: Holiday Star. When starting this review, I was well aware that this title was a side story. Still, I assumed that a well-written game should be able to stand on its own merits. At least, it should be able to close major questions and gaps that arise on its own. It should be able to contextualize some of these characters so I can empathize or understand them a bit better, but I feel like I’m plain in over my head. I don’t know. Maybe I should’ve played the previous Hatoful Boyfriend. Maybe Holiday Star just isn’t for me. It might be because I don’t know these characters as well as it expects of me. Holiday Star doesn’t guide you in – it throws you in. You don’t get a good idea of whom these pigeons are other than that you have a passing familiarity with them. I mean, you get Sakuya, Ryouta, Yuuya, the whole Hatoful Boyfriend gang, but I don’t know them. I never knew them. They’re just pigeons. The game’s lack of characterization doesn’t develop them beyond quirky pigeons with quirky character traits. I get that Sakuya is haughty and has an air of nobleness oblige. I get that Ryouta is somewhat of a straight man. I get that Anghel is a bit ‘out there.’ I get that. But beyond those snippets of information, I don’t really know that much more about them. I feel like this is something that was supposed to be shown in the original source material through each of the pigeons’ character arcs, divulging more and more about them as time goes on. 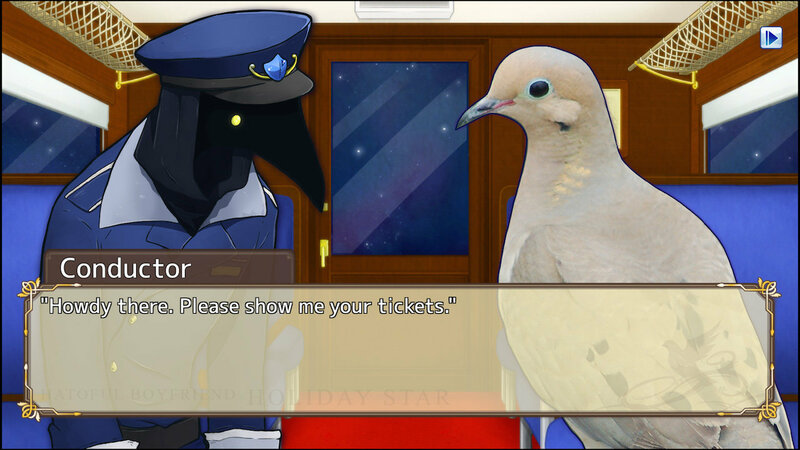 Because, after all, Hatoful Boyfriend is a visual novel. It’s not a fully interactive game with clear ludic and narrative elements. In fact, its narrative dominates its ludic elements. You’re going to be doing a lot of reading, and then more reading, and then more reading, and then a choice or two. But for the most part, there’s little gameplay. In that context, Hatoful Boyfriend‘s characters arcs make sense. They function as the ludic element. The purpose of playing is to learn more about the pigeons around you and the world around you. As a result, you get that satisfaction you would normally get from playing a game. The game itself is the character arc; that’s how most visual novels play. However, in Holiday Star, it eschews the character-focused drama. Here, it’s primarily plot-based, moving between 4 short chapters that reframe themes of family and community. That’s fine, but that’s not necessarily the best way to approach a visual novel that originally focused on character drama. I don’t get anything from this, because the stories aren’t compelling enough to enrapture me. The plot moves regardless of any illusion of branching. For instance, I don’t get any satisfaction from solving a mystery, because there’s no mechanical element – Hiyoko (my character’s name and the game’s default name) solves the mystery regardless of my involvement. Even when I make a wrong choice, enough save scumming will let me breeze through the story because that’s what I had to do anyways. It’s just not gripping. Furthermore, it seems as if Holiday Star is an enmeshment of references, connecting various pieces of Japanese pop culture together to give a sense of livelihood. Hiyoko is too eager to chant “I Object!” at various moments (a reference to Phoenix Wright) and she begins the second chapter accompanying Anghel to Tokyo Big Sight for Comiket. These references are innocuous and celebratory. However, they do imply that Holiday Star is to be experienced as an intertextual piece of media; you’re not supposed to play this as a standalone. And that’s why I had such a hard time with it. Once the novelty of them being pigeons wears off, Hatoful Boyfriend‘s – much like its “everybirdie” puns – humour becomes unfunny. It isn’t intrusive, it isn’t jarring. It isn’t annoying. It’s just…unfunny. And Hatoful Boyfriend doesn’t follow up with anything of considerable comedic substance. In fact, it plays the world of humans and birds quite straight. While the visuals show a world dominated by human engineering, Hatoful Boyfriend‘s social order is one shared between humans and intelligent, bombastic, capricious, sapient avians. That’s it. I understand the original creator’s intention: you can replace ikemen with birds and you can run a game on strong characterization and arcs alone. I assume the original did that with aplomb. But I don’t think Holiday Star succeeded in that regard. It’s a descriptive exercise as you progress through the chapters, reinforcing the meaning of joy, family, and belonging during the holidays. It attempts to ensorcell you with kitschy holiday music and almost zero meaningful narrative agency. It’s fan service. It’s a string of callbacks. Those that will enjoy it, may enjoy it, but if you haven’t played Hatoful Boyfriend, you won’t. Plain and simple.